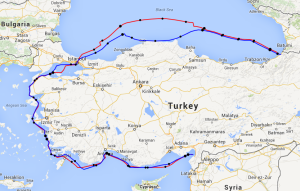 The 1430nm Sail around Turkey race has become an epic annual challenge for SOLers. The Black Sea often has shifting light winds and the middle section has both the Dardenelles and Bosphorus Straits, both tight twisting channels that after difficult to navigate under any weather conditions. The course is not much easier in the Mediterranean Sea where near shore marks require close attention. The final couple of days are easy in comparison, but lack of attention can easily result in ruining the effort of the previous few days. Let’s have a day by day look at how the race played out. The wind is often light and fickle in this large inland sea, and so were the conditions on the first day of the race. After a very slow start the wind stabilised from the NE allowing good progress to the NW into the middle of the sea. Keeping a fast boat speed was key and when the wind backed a westerly course was taken. The fleet started splitting up as the wise (or were we just lucky) managed to avoid the trap of lighter winds. At the end of the first day I was slightly behind on the course, but had advantage of the wind angle, so there was nothing in it. Some weather models indicated that there might be an advantage heading north and staying in the middle of the lake, whilst others lead to a course near the coast. There was little in it. Rafa and I chose north, Rumskib and most others chose the coast. With the wind generally NW, we were sailing into the wind. However, as the wind strength was decent then progress was good enough. At the end of the day there was still nothing to separate the two routes. However, we will see that the weather gods will favour the coastal route. The winning move was made at the start of Day 2 by turning towards Sinop. In the morning, I was in stronger wind than the coastal boats. I also managed to get a slight lead on Rafa although there was some give and take with our subtle differences in course. However, as the day developed the lighter wind that enveloped the coast drifted NW and stronger wind developed behind. This allowed the coastal boats to accelerate earlier. I gybed to sail into better position but Rumskib’s better wind strength gave him the lead. The Bosphorus is a small gap between Europe and Asia, rich in history and full of commercial ships. We do not need to worry about hitting boats in our virtual world, but hitting land is very likely. The strait is 17nm and only 700m wide with many twists and turns. I had set plenty of dcs (delayed commands) as it was the middle of the night, and I like sleeping. I woke at 4am to find that I was having a rest on land. Rafa and Franci sailed past me as I slipped to fifth place. I had not even made the first turn and had hit the rocks. Sleep was gone and a dozen turns later I escaped the trap. I set a safer and had a nap. The weekend was over but sailonline carries on. 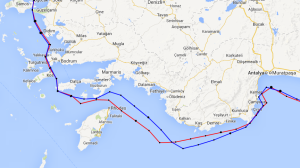 DCs were set for the working day through the middle of the Sea of Marmara. My route through the middle of the sea was a good one, I stayed in better pressure and overtook three boats to climb to second. Ghibli retired, an early victim of the needs of the race, after sailing very well through the Black Sea and leading past Istanbul. 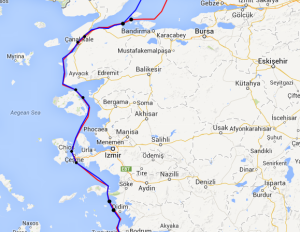 The Dardanelles is the twin of the Bosphorus, even longer but not quite as wide. History in this part of the world but also tinged with sadness, 100 years ago almost to the day terrible battles raged. Thousands of lives were lost in the folly of war. Every year New Zealand, Australia, Turkey and many others commemorate their loss. I avoided hitting land this time and into the Aegean. The slightly more open water allowed easier sailing, but not by much. The course designer had thought that the straits were not enough of a challenge and added in a few islands to round, forcing the fleet to keep close to shore. I had no trouble with the first few, but sleep beckoned and some slow sailing allowed Rafa to overtake me again. Rumskib had no such challenges as he forged on ahead. 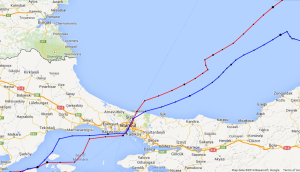 The sea becomes more open after Samos, but the fastest course sometimes keeps up close to land. Too close on occasion, as a rare mistake from Rafa allowed me to overtake. He had a comfortable lead on me at this stage and would probably have finished again if he had not beached. Franci also had a rest on a beach and lost touch with the lead. No such trouble for Rumskib as his flawless race continued. At times his course was outrageous as he dodged between little islands. Was our competition not enough? Navigation was somewhat easier, but as the wind as astern regular gybes were required. The difficult polar on the 90 foot monohull also required attention, as the best angle changes with the wind strength. The course I set during my sleep time was not great, but good enough to maintain my position. I gybed too early and was slower than ideal due to lighter winds and deeper sailing. The bay off Antalya usually has little wind. Approaching the mark in the bay can be tough to navigate. Do you stay offshore and come in late and fast, or hug the coast for shorter distance? The coast was much better for angle this time. The shift required a couple of tacks but there was no trouble rounding the mark. The next few hours were a relaxing broad reach. Another shift came through approaching Anamur. I made a mistake and tacked too early then sailed maximum VMC by sailing fast and low. Rafa and Rumskib did much better by spotting a localised band of stronger. I had a worried hour or two but was able to gradually close the door on Rafa. My second place was nearly lost I had just enough rounding the last headland to secure second. The last 18 hours or so were no such trouble. There was a final patch of blue to negotiate close to the finish but with Rumskib a long way ahead and my second place safe it was a stress free finish. Congratulations to Rumskib on his flawless race. Thanks to Rafa for keeping up the fight and well done for rounding out the podium. Hours after we finish, the valiant and determined SOLers will cross the line. Chapeau to you all. Previous PostIntroduction to QtVLMNext PostWelcome!